All your friends are already nearby in Rawl'kha, yes? Invite them over to have a party at your so-sleek riverside house, with its private garden and over-creek deck. Much sweetness! 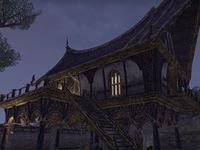 Sleek Creek House is a medium player house in central Reaper's March.